Feb 2015 Reflection Ridge __ Reviewing this place is true altruism on our part, because we almost wish we could keep such a wonderful vacation spot to ourselves. Professionally managed, convenient, clean, and with great care taken to make things comfortable for the guests. December 2015 Sabino Vista Retreat___ The photos do not do it justice! The kitchen is great! Lots of dishes, pans, etc and room for all six of us. Love the dining areas. Feb 2015 Sabino Vista Retreat __ We thoroughly enjoyed our stay. October 2014 Sabino Vista Retreat __ Always a pleasure to make arrangements through Kimber. We appreciated all the updates - new carpeting an paint. Feb 2015 Sabino Vista Retreat __ The property is very nice. We enjoyed being here and will look forward to another stay. This has been a wonderful place to enjoy Tucson and the surrounding area. Thanks so much! We had a wonderful 2 weeks. We'll be back! Jan 2014 Sabino Vista Retreat____Booked this house for a week in Tucson. It was in a great location for the golf courses we wanted to play, had lots of space for each of us and fit our needs perfect. The outside bbq was used to cook dinner a few nights and vcr collection was used to watch a few classics. Overall a nice house for this type of rental. July 2013 Sabino Vista Retreat __The property was beautiful! Every amenity we desired was available. Booking was easy and the directions were clear. We will return in the future. October 2013 _Sabino Vista Retreat_Kimber and Corby's availbility was much appreciated. Everything was good! 2012 -Sabino Vista Retreat - We sure have enjoyed our stay in Tucson. I really liked the floor plan and the furnishings are comfortable. Your parents did good and I can understand why your keeping it in the family. We especially enjoyed the watercolors. We enjoyed our meal at Chaco's. Be sure to tell future house guests with pets about the dog park at Udall park and walking along the Wash. The closest access to the wash with parking is on Pantano Road. Simon loved his time here too. 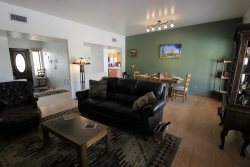 -Sabino Vista Retreat- My girlfriend and I live in the city. It was wonderful to come to a warm open house and relax. We spent a lot of time in the backyard looking up at the mountains and enjoying the quiet. We made sure to the spend an hour before dark with a favorite beverage admiring the spectacular sunsets paying attention to the sky and the changing color of the mountains. We cooked most of our dinners to take be home at sunset. The kitchen was large, easy to cook in and had all the utensils and cookware we needed. While we spent time in the back garden we also loved the breakfast nook and living room. The high speed WIFI internet made it easy to do some work or just read the newspaper from home. Direct TV gave us plenty of viewing options. I would highly recommend this home. 2006 Sabino Vista Retreat __I spent a week vacationing in this home with my family and friends (including 4 children ages 12, 8, 7 and 4) and loved it! There was plenty of space to spread out, and we cooked and ate like kings. We grilled and watched the spectacular Arizona sunset from the back patio every evening. It felt like a deeply relaxing place to be. And though we loved exploring the Sabino Canyon, and watching the kids play in the pool, our favorite memories are our time at the house, playing sardines in the cavernous closets, and resting together from the busyness of life. I am SO glad to see this place is still available to rent, and can't wait to get back there soon! Jan 2015 The Greens 14273___ 10's across the board. The outfitting of the property with the amenities (IE, Appliances, maps brochures, etc) standards of rental is high and nothing malfunctioned! March 2014 The Greens 14273__The property was as nice as advertised. We truly enjoyed our visit. March 2015 Greens 14273__Very clean, well equipped (dishes and linens), nicely furnished and a great TV. March 2015 Hacienda Joesler__The general ambiance of the house and the setting are the best - my sister, brother-in-law, daughter and two granddaughters will remember this with good feelings for the rest of their lives (me, too!). March 2013 Hacienda Joesler ___Everything was as advertised. We very much enjoyed ourselves. June through Sept 2013 Boulder Canyon_12203 _ I had a wonderful time in Tucson, enjoyed people, did not enjoy the heat, enjoyed the condo. Thank you for everything ladies. If you ever need a reference or recommendation, give a shout. Please thank the owner for me. July 2014 Canyon View __15205__ Provision of amenities was excellent. Towels, linens, soaps, cleaning supplies, etc. Ease of booking the reservation was a 10!